The Pharmaceutical Brand Campaign consisted of name development, Identity/logo design, packaging, direct mail and sales materials for NeoBenz Micro, Rx dermatological acne treatment cream. 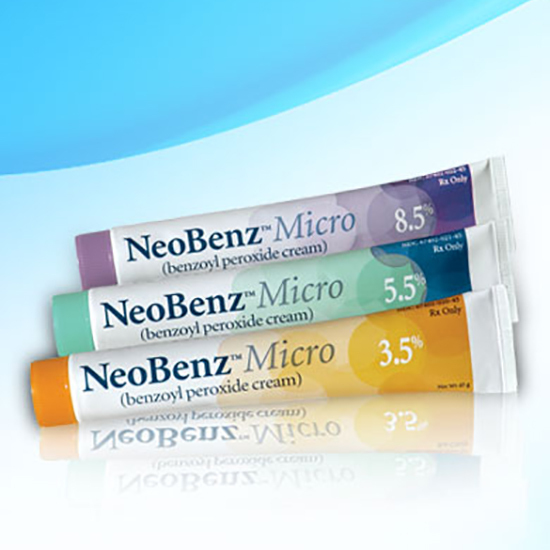 The product’s unique benefit was that it combined benzoyl peroxide-a proven, powerful antibacterial medication-with the MICROSPONGE delivery system. We incorporated the MICROSPONGE bubble shapes into the visual identity of the brand in order to differentiate it from other competitors. NeoBenz Micro uses the MICROSPONGE delivery system and is available in three different strengths. These sales materials conveyed how easy it was for the patients to take the medication with them anywhere, therefore following the prescribed regimen for better efficacy and results. The wall clings were requested by the sales team to place in the sample rooms. We also Created a physician-targeted sales piece that introduced NeoBenz Micro Wash Plus Pack to eliminate substitutions of SkinMedica’s Wash they had just launched earlier in the year. A brand that is more user friendly in how it presents the MICROSPONGE delivery system; its unique selling strength. 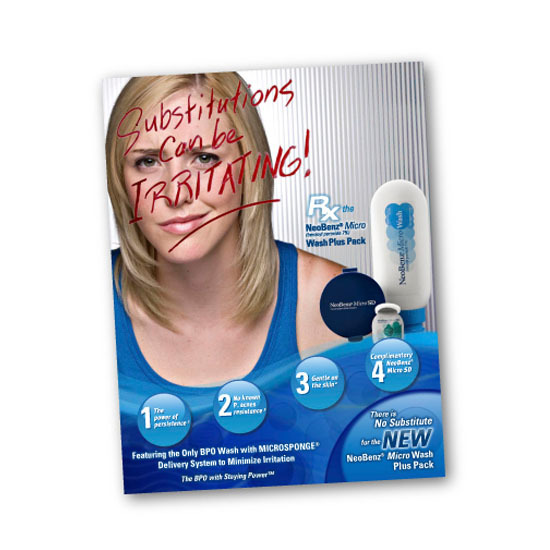 The Pharmaceutical Packaging is more youthful and contemporary. A look a teenager would have no apprehension to leave on their counter, therefore increasing compliance. Due to the success of this Pharmaceutical Brand Campaign, SkinMedica extended the brand with 4 additional products after the initial product was launched.